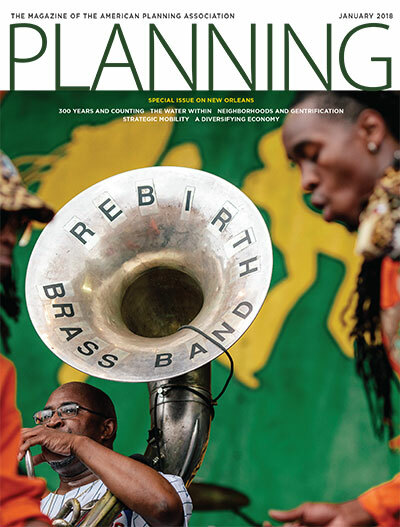 Planning starts 2018 with a close look at New Orleans, host city of APA's National Planning Conference in April. Find out how the Crescent City, which celebrates its tricentennial this year, has taken up resilience-based planning in a big way, for water systems, transportation, economic development, and more. New Orleans plans for a new — more resilient — century. Martin C. Pedersen reports. Take a quick peek at the vibrant culture of the Crescent City. A new strategic mobility plan means getting around the Big Easy could get a lot easier. Story by Jeffrey Goodman. The region's regular enemy could be its best untapped asset, writes Emilie Bahr. Missy Wilkinson takes us through a city of neighborhoods — and the forces that determine who gets to live in them. As New Orleans diversifies its industries, Craig Guillot surveys the economy's growing trends — and challenges. A regular column by Chief Executive Officer James M. Drinan. Bypassing landslides, No Small Plans. Dockless bike share, private tree ordinances, census funding. Timothy Beatley highlights a new green urbanism project that puts community engagement first. Equitable energy, mobility, and economic development. Public art, municipal LGBTQ equality, mapping a new database. Theory plus practice equals a balanced planning education. Cover: The Rebirth Brass Band performs at the 48th Jazz and Heritage Festival in New Orleans in 2017. Photo by Bryan Tarnowski/The New York Times.